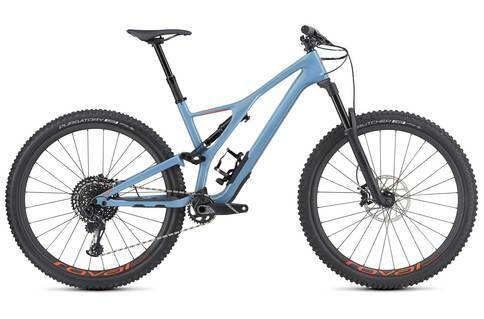 The mid to high range of mountain and trail bikes known as the Specialized Stumpjumper series is exactly what it sounds like. This range has a huge variety of models with different geometry, price ranges, weights, and specs to suit your trail and climber needs. Specialized is known for producing some incredible MTB and cross country bikes, so you can be sure that you will be getting something good for your money. At the mid to high price ranges, the Specialized Stumpjumpers offer up some competitive specs and ultra lightweight frames. We loved the models we tested for this review, from their geometry to the componentry. We took these hardtails on some known rough trails as well as through the city to see how they would feel. Overall, performance was impeccable. The pro models have carbon frames and forks and at that price, you’ll be glad to know they deliver! Even on the lower end, aluminum frames are lightweight and well shaped for a breezy ride. These bikes take impact like it’s nothing, and offer up some incredible speeds. This is no surprise, as Specialized has been fine-tuning the Stumpjumper for the last three decades! Needless to say, this will be one of the best investments you can make! Overall, these are amazingly well-designed MTBs, even at the bottom of the line, and serve well on any terrain. We loved the look, specs, and performance of the Specialized Stumpjumperbikes, and we would recommend the top models for competition. These impressive hardtails will be worth their price, whether you buy from the low end or the high end of this range!